Ouran High School Host Club Wallpaper: A Hot Summer Christmas! 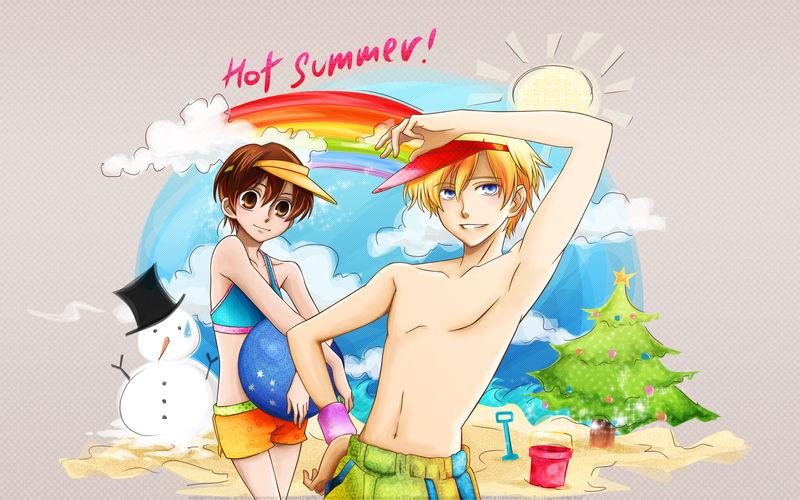 Minitokyo »	Ouran High School Host Club Wallpapers » Ouran High School Host Club Wallpaper: A Hot Summer Christmas! Happy early birthday to mah gurl Fran ♥. lol you were the one who actually motivated me to do this wall because well IT'S SUMMER DOWN HERE! >:O Title is f(x)'s song, "Hot Summer", I know you love them :D.
First off, this is for the MTM Wintry Wonderland II. Summer is evidently not winter, I know. But on behalf of everyone in the southern hemisphere who experiences Christmas in summer, I feel we are always marginalized ;A;. Plus, I'm sure you're all jelly at our weather at the moment XD. So I've chosen to use the snowman, who is now melting in our summer heat :D. I'm sure this is quite different from what you were expecting XD. But yes, next year, don't make it winter themed D: In Australia, lots of people like to head on over to the beach to celebrate Christmas! I actually hate the beach, but I like what it represents XD. Secondly, hi! I've been on hiatus for the last few months because I had to study for university entrance exams (and passed them with flying colours~) so now I'm back! However, I'm not sure how regularly I will be walling from this point on because I have no idea what uni will be like, plus I want to focus on improving my own artworks too, so we'll see! But it's quite nice to hit the submit button :D.
Thirdly, okay, onto the wallpaper! I'm a little out of the loop with the current anime/manga series so I went with a classic... Ouran! Vectoring is always a pain and I haven't done it for a while so I'm a bit rusty. I highly doubt my technical skills have improved at all ;A;. The wallpaper is done like usual... vector the characters blindly and then worry later about what on earth you'll do for the background. I used ten tonnes of patterns and used my favourite colour palette of blues, reds, greens and yellows again *____*. I added a few extra colours to their hair, because in summer someone always gets a new crazy hair colour. This took me only a day (so about 6 hours ish) to do the entire background + finish colouring Haruhi, though lining Tamaki started a week ago. I tend to wall pretty fast because the ideas just come in floods and if I don't add them in now, I never will XD. The total file size is about 350 MB. Additional non-christmas version is available - it's just the christmas tree sans christmas decorations should you want to use this wallpaper later on or don't celebrate Christmas :D. Happy holidays! Yay I got to see funky colors that don't clash but mix very well + multishading too! I must say it's a very creative way of expressing Christmas. Good luck on the contest! OHHHH THIS APPEALS TO EVERY SINGLE ONE OF MY INTEREST. >:D Adore the coloring style, the color, the originality, omg everything is so so so cute Aqi. Anyways, bright stuff as usual! I love it! The background really catches my eyes, and the concept was superb! ah, I love it, the colours, the patterns, the aqi all over it. Would love to experience a wintery christmas one day. Cute wall overall! I like it! I can't believe I'm getting a summery-christmas wall, life is seriously perfect now. I'm with you when talking about Christmas in summer and so I really liked your wallpaper! xD Great job on that one! haha, nice and colourful and bright wallpaper, I love the rainbow and the melting snowman. Poor Christmas tree is suffering though, lol! "I was in Santa's workshop, how did I end up here?" Hooray for Summer Christmas! Thanks for this wall, it is wonderful. I especially like the textures, their hair and of course the snowman. Great job!